Savage Alchemy are a new beard care brand and they have sent me 3 of their scents in the beard balm, butter and oil. I have already used the Obsidian beard balm and butter and so it was then the turn of the beard oil. It is a blend of Hemp seed oil, Jojoba oil, Argan oil & Sweet Almond oil and its a decent beard oil. The hemp used is obvious throughout the range by the slight green tinge of the products. It has left my beard feeling nice and soft, it has that slight healthy sheen, it feels nourished without feeling greasy and so it ticks all of the boxes! The Obsidian scent is a blend of Pine, Birch & Black Spruce and it has in the balm and the butter reminded me of an oil that we use for pulled muscles, blocked nose, headaches etc. But the scents are always a bit brighter in the beard oils, you can pick out the individual scents a bit easier and I could recognise a smokyness to the scent blend, a very slight sweetness and of course woodsy. I have to say that the scent is not for me, but I can appreciate that it has been blended well. 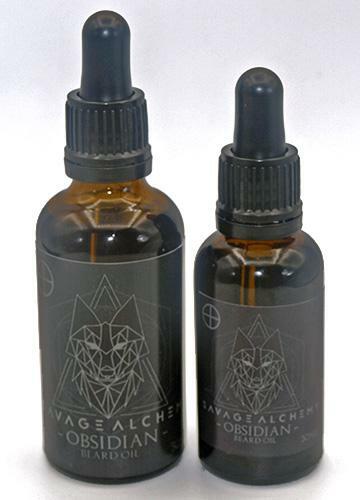 The Savage Alchemy Obsidian beard oil comes in a brown smoked glass bottle with a glass dropper and is available in two sizes, 30ml for £10.99 and 50ml for £15.99 from the website.